Humble? Maybe, but postcards are oh-so effective. They’re an often-overlooked marketing mix element that can highlight points in your appeals, direct mail packages, e-mail marketing messages and newsletters. That’s because anyone can afford to use them, and use them often. 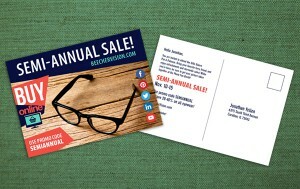 Postcards are economical to produce and to send. Since there’s less cost involved, you’ll be able to get in front of your readers regularly – an important key to higher response rates. “But a postcard is so small!” Yep. Good postcard copy carries a single message. If you try to say too much, your jewel tool will be jumbled and lose its punch. Instead, zero in on one specific benefit for your reader or one particular action you want him to take.